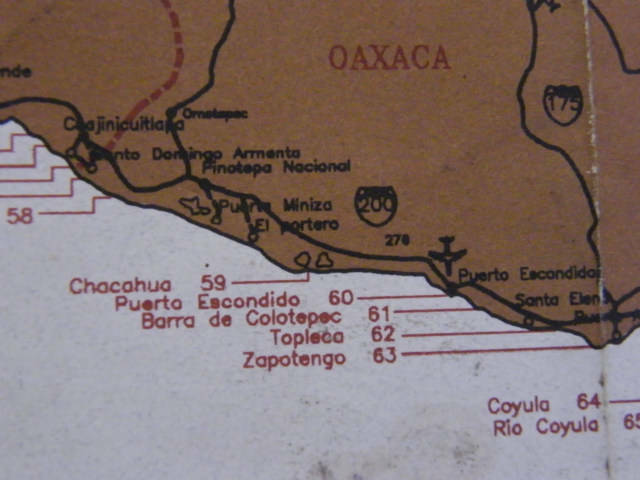 Maps are fun, I know this beach, I know the area, I used this beach in Mexico for a base for over a year. I know this area; I understand how Google Maps works was able to find this Satellite Map quickly of my present location. I hope this map is visible and all went well, I only put this up this way because I think Google.com will stay in business and the map will continue to exist. I always laugh, when I was in the Caribbean, rich fat people, if I was rich, the last thing I would do is go to a beach full of rich fat people. Pie is a weak on bikinis, however I have seen in one week more nice bikinis at Pie de la Cuesta than three months of traveling in the Caribbean. 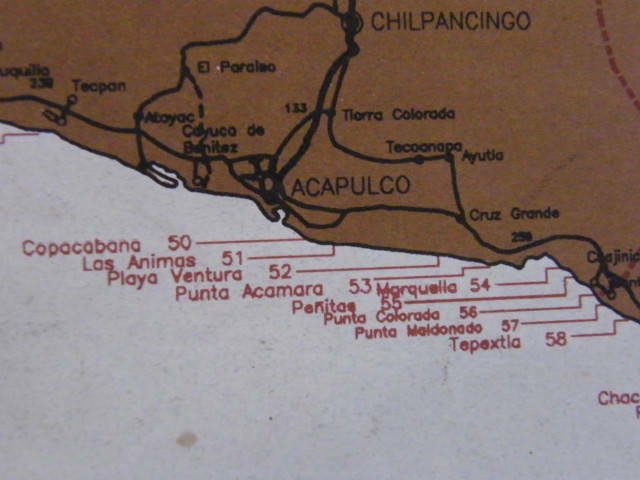 Map of Surf places on a map I found in the Pie de la Cuesta Internet Café. Map of Surfing around Puerto Escondido about 10 hours, maybe 20 dollars south of Acapulco. I took photos of the map and all the surfing locations all the way down the coast to Guatemala.